Iran’s truck drivers embarked on their fifth round of strikes on Saturday, December 22nd in protest of the regime’s refusal to fulfill promises made to the truckers during earlier strikes, based on reports from the MEK sources inside Iran. This round of nationwide strikes differs from the first four strikes in that its organizers have pre-planned it to last for ten days. Having learned from the previous strikes, the truckers are now using their experience to organize in order to more effectively achieve their demands. The latest round of strikes began after most of the country’s truckers stopped working in protest, effectively going on strike. 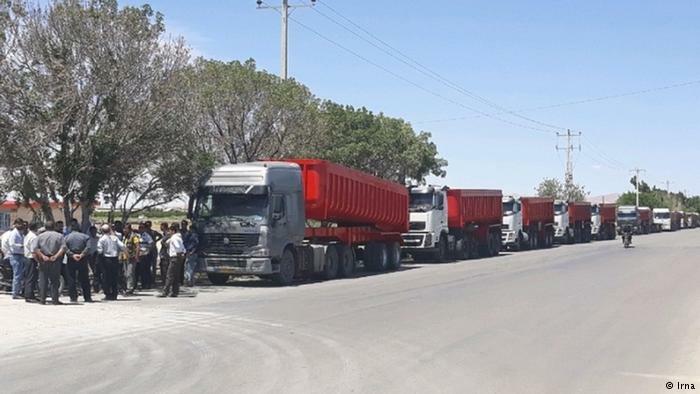 The first round of truck drivers’ strikes was launched on May 22nd, 2018 and quickly spread to hundreds of cities across Iran. The nationwide strikes went on until June 8th, when regime authorities agreed to make a number of concessions to the drivers in order to end the strike. These promises would go unfulfilled. The strike did not receive a great deal of attention because of competing news events occurring at the same time. The World Cup, in particular, diverted coverage from the protests. Although the strikes yielded few tangible results in the short term, they set the stage for subsequent strikes, which would prove to be more productive. On July 23rd, 2018, Iran’s truck drivers began another round of strikes, which spread to 300 cities and went on until August 11th. Protests broke out in Isfahan’s Shapur City in solidarity with the striking drivers. Other anti-regime protests began and spread quickly to a number of cities in Iran, with the largest concentration of protest activity taking place in Tehran, Isfahan, Karaj, Shiraz, and Rasht. The truck drivers’ strikes were the catalyst for the nationwide protests that took place in late July and early August. These protests brought Iranians from all sectors of society into the streets to demand their rights. The MEK’s resistance units became more organized in its efforts, which enabled protests to grow and spread more quickly. The protests also struck fear into the hearts of the mullahs, who realized that their efforts at brutal suppression were no longer effective. The mood in Iran changed after the second truckers’ strike and subsequent protests. The truck drivers inspired other workers to strike for their rights. Their coordination and ability to organize and stand in solidarity with each other laid the groundwork for other workers to launch their own strikes. The stage was now set for the strikes by the Haft Tapeh sugarcane factory workers in Shush and the Iran National Steel Industrial Group workers in Ahvaz. Iran’s truck drivers embarked on their third round of strikes on September 23, 2018. The strike spread to more than 200 cities by its fifth day and received international support from labor unions, including the International Transport Workers Federation (ITF) and the Teamsters, among others. The workers continued their strike for 21 days, despite the arrests of more than 200 striking drivers. 17 of the arrested drivers were threatened with execution. International human rights groups, as well as labor organizations, condemned the regime’s treatment of the truck drivers and called for their release. The MEK and the Iranian Resistance condemned the Iranian regime for its threats of execution, and Mrs. Maryam Rajavi, leader of the Iranian Resistance, called upon the United Nations to take action to secure the release of the arrested truck drivers. The strikes drew attention to the Iranian regime’s brutal labor practices. Instead of intimidating the people, Iranians became more determined to overthrow the regime. The fourth round of strikes began on November 1st, 2018 and spread to dozens of cities in Iran. 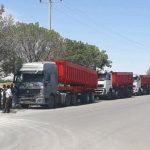 The truckers launched this round of strikes in order to secure the release of their colleagues who were arrested in the third round of strikes. The fifth round of strikes was launched on December 22nd and is set to last for a total of ten days. The truckers have gained valuable experience from the past four strikes, and they have also learned from the nationwide protests and strikes that have swept Iran over the past year. They have heard the regime’s false promises and will not be deceived again. Loading station where all drivers are on strike as drivers are on the 5th day of a nationwide strike demanding higher wages. The people of Iran are more organized and determined to reach their goals, and the regime’s efforts to suppress dissent and refusal to listen to their demands have only increased that determination.